Why LBell Emergency Personal Alarm? User-Friendly-Sleek, smart and compact design makes it easy to carry, you can carry it anywhere. Built-in LED light-Offer a bright LED light, activated by pushing a button and used for illuminating a dark area, find a keyhole or provide light. Broad Application-Excellent security option for any age. Preferred for women girls elderly children security, walkers, joggers, lone workers. It's also a necessary supply for traveling, hiking, camping and walking the dog. Ideal Gift-This cute portable personal alarm is an ideal gift choice. The practically designed alarm could be hardly noticed by attackers or others. Easy Use-Pull the pin out to activate the alarm and insert it back to stop it. The sounds could last 50 minutes. Product material: ABS environmental plastic. Product color: black, silver, rose gold. 【Multi Function】: Portable personal alarm can disguise as a bag decoration while serves as a self defense protection and a mini flashlight, you can carry it on your backpack, ladies bag, belt loops, schoolbag, suitcases etc. 【Ideal Gift】: A great choice for all ages: Women, Elderly, Students, Kids, Joggers, etc. It's also a must-have supply for traveling, hiking, camping and walking the dog, timely call for help, starting from the personal safety alarm. 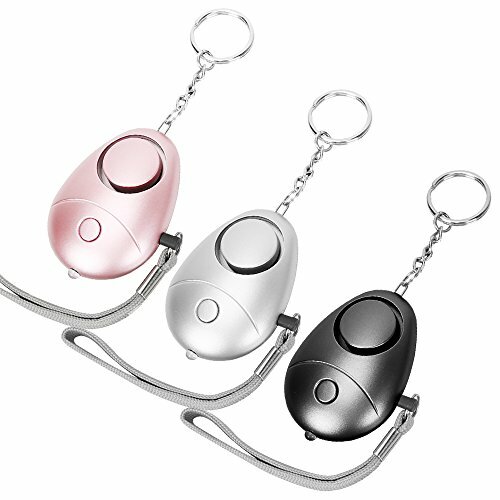 【Small, Portable, Hidden】: How about a hidden, portable personal alarm that easily goes for a keychain or handbag decoration? The personal safety alarm is designed to come in handy anywhere you need it. This accessory can be attached to your hand bag, or your kids school bag. Arm your family with an emergency alarm and keep your peace of mind. 【One Year Guarantee】: All of our emergency personal alarm have been rigorously tested, if found quality problems, please feel free to contact us asap, order risk-free with our Moneyback guarantee today.